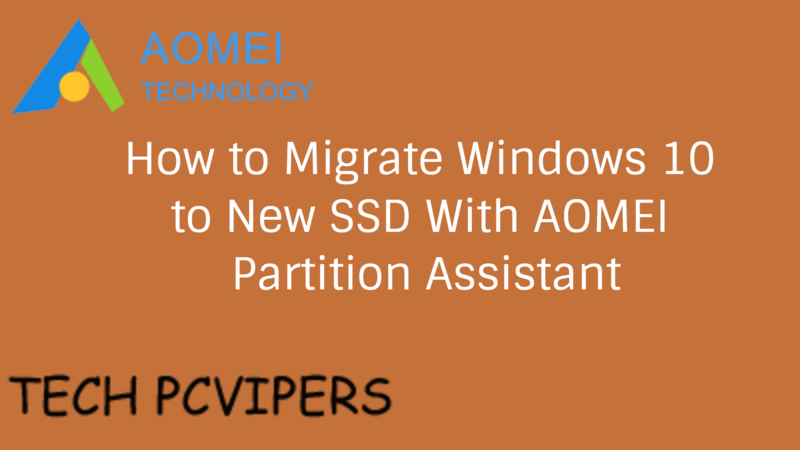 Migrate Windows 10 to new SSD without installing OS easily with AOMEI Partition Assistant Standard. 100% safe and secure tool. No need to reinstall everything again. Guys, I’m going to buy a new SSD, likely a Samsung 850 EVO to put my Windows 10 installation on it and I do think 64GB will be fine for an OS installation. I heard that someone can use reset Windows feature to change the installation path and put it on another drive. The question is, will I then have two installations, one on the SSD and one on the old HDD? Is the reset feature and/or installer smart enough to realize you have it on an HDD in the same system and basically label all the old OS info as free space or something? You may notice the same problem is often asked on many forums. It’s clear that transfer Windows 10 to the new SSD could solve the problem. Windows 10 has become a quite popular desktop operating system in the current days. The improved desktop experience and native security protection Windows Defender antivirus software attract more Windows users. As we all know, it’s a time-consuming process to install the operating system. Thus, most computer users will try to avoid reinstall system until the system has serious problems. Since Windows 10 needs a more advanced configuration, to migrate Windows 10 it is the best choice to enjoy a better performance. Note that simply copying the system drive won’t boot your Windows 10. You need professional migration tool to transfer Windows 10 to new SSD. Known as electronic hard disk or solid-state electronic disk, SSD refers to the use of flash memory chips composed of SSD solid state hard drive, is the use of FLASH flash memory particles as a storage unit, no longer use the traditional mechanical storage methods, the use of analog virtual virtual access mode and sector, etc., can also be simple Understand the solid-state hard drive is a hard disk interface (SATA / ATA, etc.) “big U disk”, the difference is no mechanical structure, the use of traditional NAND Flash features to block write and erase the way to read Write function, so the efficiency of reading and writing, relying heavily on the development of flash memory technology, compared with the traditional mechanical hard drive, with low power consumption, seismic, high stability, low temperature and other advantages. SSD has a lower energy consumption and more safer for data storage. 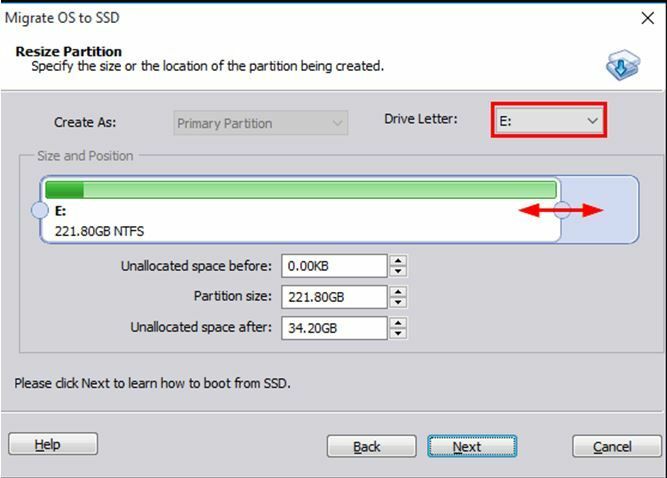 Why need to migrate Windows 10 to new SSD? 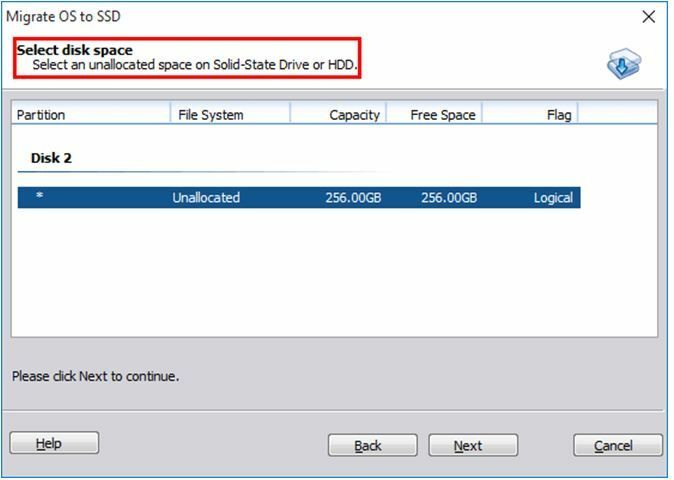 Besides migrating, actually you can have a clean install and that is to say, you have to install programs and applications again to the SSD. Well, it all depends on your own decision based on your time and energy. Generally speaking, we recommend migrating Windows 10 to the new SSD without reinstalling the system. Here AOMEI Partition Assistant Standard is the perfect tool to solve the problem. AOMEI Partition Assistant Standard is a complete and powerful free partition software for personal and commercial use, which could help you to migrate Windows 10 system from the original hard drive to a new SSD easily. 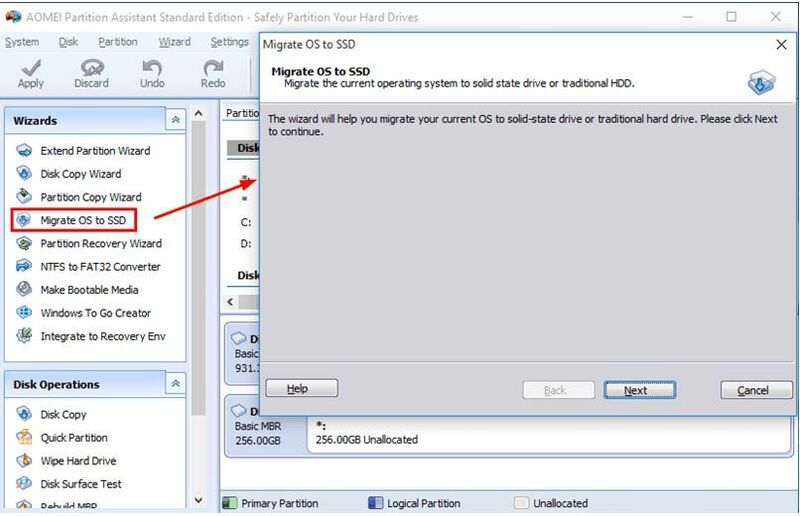 The designed feature “Migrate OS to SSD” allows you to clone only system data without any data loss. It supports both MBR disks and GPT disks. It supports all Windows editions including Windows 7\8\8.1\10\XP\Vista of both 32it and 64bit as well. While being a disk cloning software, AOMEI Partition Assistant Standard is also a free disk partition software to manage the partition and hard drive, helping you get the full features for creating, resizing, deleting, merging, splitting partition and more. You can also easily upgrade hard disk and transfer a large number of data from one disk to another, convert MBR to gpt and convert file system from NTFS to FAT32 without losing data. Check pending operations and if there is no problem, click Apply to migrate Windows 10 to new SSD. Then shut down a computer and enter BIOS. Please set the new SSD as the first place to boot your computer. Since the operation involves the bootable partition, it will be completed under the boot mode. With AOMEI Partition Assistant Standard, you can migrate Windows 10 to new SSD without installing operating system safely and successfully. It’s the best utility tool for those users who don’t want to reinstall everything again. 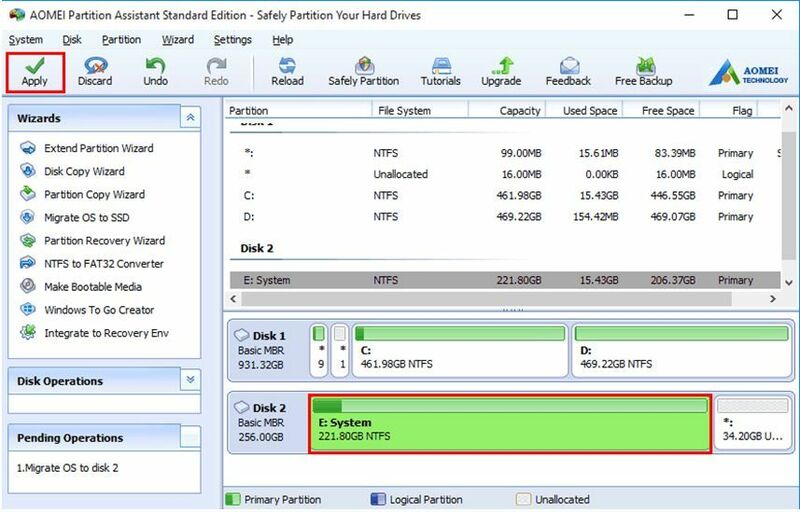 Moreover, being a powerful disk management, you can also use to manage your partitions and hard disks.